The Pic du Midi is both a remarkable viewpoint over the Pyrenees and a famous astronomic observatory. For a few hours or a night people can go there to observe the stars and discover the work of the scientists. 860 km from Paris on autoroutes A6a and A10 till Orléans, then on A20 and A62 till Toulouse, then on A614 and A64 till Bagnères-de-Bigorre, then on D935 and D 918 till La Mongie. TGV from Paris Montparnasse to Tarbes. Journey takes approximately 5 hours 15 mn. Bus from Tarbes to La Mongie once or twice a day. Duration of the journey : 1 hour 30 mn. 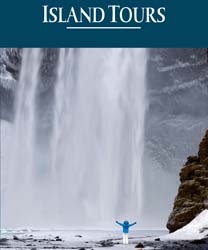 Open every day from December 1st to April 7th and from June 1st to November 3rd. 9.30am to 5pm from December 1st to June 30th and from September 1st to November 3rd, till 6pm or 7pm during school holidays. 9am to 7pm in July and August. Cable car rides and visits to the summit. Rates : €129 per adult and €99 per child with dinner. Booking required as only a limited number of tickets are on sale. Usually every day in July, August, late June, early September and during school holidays, from Thursday to Sunday during the other months but dates can vary depending on the scientific researches going on. Check on Pic du Midi website. Rates : from €339 to €399 per person in a single room, from €399 to €449 for 2 persons sharing a twin room. Although it’s not one of the some thirty Pyrenean summits over 3000 m, the Pic du Midi is nevertheless one of the most widely known. 2 877 meters high, it owes its fame to the astronomic observatory built there at the turn of the 19th and 20th centuries and where some major discoveries took place. The 4th ring of Saturn, Janus, the 10th moon of this planet,…. It’s also here that the coronograph was tested, an instrument invented by French astronomer Bermard Lyot to observe the sun’s crown. More recently, in the 60s NASA chose this spot to map out the moon in order to prepare the Apollo missions. Located just in front of the Pyrenees Mountain range, the Pic du Midi is less affected by atmospheric turbulences and enjoys a very transparent sky. This monument of astronomy was opened to the public in 2000 and since summer 2006 it’s even possible to spend the night there watching the stars. Getting there only requires 15mn by cable car from La Mongie, a ski resort located below the Tourmalet pass at 1 800 m of altitude. Built in 1952 and recently renovated, it put an end to the martyrdom of the scientists and the men in charge of supplies who previously had to get there by foot. A 10 – 12 hours walk along a path that people fond of hiking can still do. Twice a day, depending on the season it’s also possible to board the cable car with skis or a mountain bike in order to free ride ski or pedal to the bottom of the valley. A crazy descent with a difference in altitude of 1800 m the best bikers run in about 22 minutes and amateurs in 1 hour !!! If the sky is clear. According to the statistics it’s like that 120 days per year. As for the remaining period of the year it’s split equally between 120 days with mild weather and 120 days with clouds surrounding the summit. So a bit of luck is necessary to fully enjoy the Pic du Midi and be able to watch the stars. The history of the site and of the scientific installations there are explained through a short movie screened in a museum which has the distinction of being the highest in Europe. This makes for a fascinating introduction to astronomy and the observatory’s activities since it presents the characteristics and functions of each cupola, each telescope, and the research done there. In addition, it gives information about planets, the sun, stars and the creation of the universe. A very informative display perfect for riveting children’s attention. For example to give an idea of the scale of the history of the universe, it is compared to one year with the Big Bang on January 1st, the birth of the solar system on September 9th, appearance of life on September 29th, of Man on December 31st at 22 h 30 and the birth of Christ on the same day at 23 h 59 mn and 59 s.
After such a visit one inevitably wants to have a look through a telescope and the Pic du Midi is one of the best spots to do so. Fom time to time “Starry Evenings” are put on where several workshops led by astronomers offer different activities. A presentation of astronomical instruments, observations of the night sky by telescope and the naked eye, a screening of a slide show about the sky on that particular night and question and answer sessions with astronomers. A glimpse of astronomy, no more, as these evenings end by 23 h 30 and the number of participants only allows a short time for everyone behind the telescope. So it’s much more interesting to spend the night at the summit. In this package the number of guests is limited to 19 and an astronomer is with them throughout the stay to answer their questions and give them information. Rooms are simple but comfortable, with shared showers, and after a welcome drink the stay starts with a guided tour of the museum. 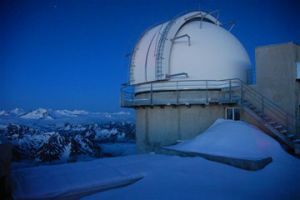 Then it’s time for dinner at the Pic du Midi’s restaurant that serves traditional dishes from the South West of France. The right time to get to know the other visitors all attracted by the fame of the place. They are either fond of astronomy or beginners coming to discover this science. Before, during or after the meal sunset on the Pyrénées is a show not to be missed. But the greatest moment of the night is of course the observation of the sky through the 400 mm telescope of the Charvin cupola. During approximately 3 hours, the guide points it successively at galaxies, nebulas, clusters of stars, double stars and finally at the rings of Saturn and Jupiter flanked by its moons. These two planets always bewitch beginners and everyone looks through the telescope one after the other. Meanwhile, binoculars allow for fine observations of the constellations and permit visitors to plunge into the heart of the Milky Way that seems almost within reach. But, be careful, to fully appreciate these heavenly bodies don’t forget to bring warm clothes as the cupolas are not closed. At this altitude maximum night time temperature is 8°C in summer and it can drop to –30°C in winter. As for the wind it sometimes reaches 300 km per hour !!! However it’s better to have cold than clouds which prevent any viewing via the telescope. In such a case guests are invited to attend a video computer screening where the Stellaris software recreates the celestial vault over the Pic du Midi. This is the opportunity to learn how to recognize the constellations, the origin of their names and many other space secrets. But there is still a chance for real observation. It can happen that the sky clears up during the night in which case the guide wakes up those who so wish. Everybody can thus meet in the cupola at 2, 3 or 4 o’clock in the morning. Anyway, nights at the Pic are always short since wake-up time is a little before dawn in order to watch the sunrise over the mountains which sometimes seem to emerge from a sea of clouds. Another fabulous natural spectacle. And it’s not over. After breakfast the program continues with the visit of the scientific installations. The Bernard Lyot telescope, France’s largest at 2.03 m in diameter. The coronograph, a telescope which allows for live observations of the sun’s crown and its famous eruptions. Thus, it’s not before 11 am that everyone is back in La Mongie with a head full of stars.